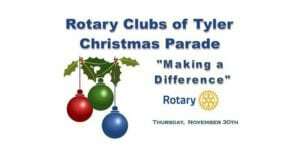 The Rotary Clubs of Tyler will be hosting the 20 17 City of Tyler Christmas Parade and Tree Lighting on Thursday, November 30, 2017. We invite you to downtown Tyler for the parade that will wind from North Broadway, around the square and culminating on Spring Street. Keep an eye out for the 2018 Miracle Child! They will be leading Santa Claus onto the Square before lighting the City’s Christmas Tree! With over 120 entries of floats, bands, and dancers this will be an joyful event sure to get your entire family in the holiday spirit! The parade will begin at 6:00PM and last approximately 1 hour.